Sports action camera captures amazing moments and great memories with this digital camera. This fantastic waterproof digital video camera camcorder comes with 2'' LCD display, support for wireless remote control. 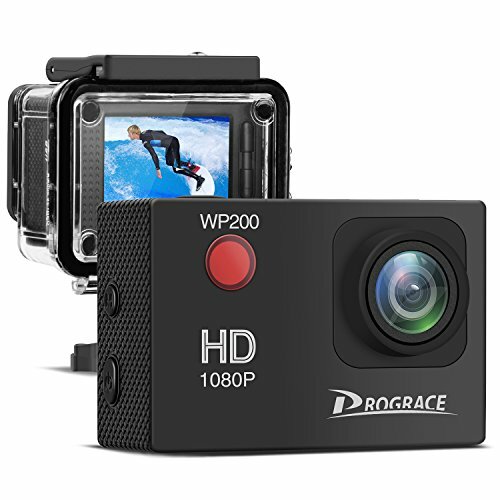 【Full HD 1080P Sports Action Camera】Very basic start action camera, easy to handle. With full HD 1080P. Enabling you to capture every scene and record any moment with 2.0 inch LCD screen. 【High Waterproof Performance in 100feet Depth】The waterproof case of the video camera do have excellent water resist, functions well 100feet underwater on many underwater sports like diving, swimming, snorkeling. 【Can Work as a Dash Cam】There is a car-carrying mode for this digital camera. Open the loop recording mode. The action cam will take a segment every 3 minutes. When the SD card is full, it will automatically delete the earliest segment. 【Video Camera Can Work with SD Card Up to 32G】This helmet camera can support SD card up to 32G. (SD card not included, you need to purchase a SD card before using). 【Many Accessories for Different Application】Comes with other fascinating style mounts accessories kit, available for many kinds of sports, such as cycling, motorcycling, running, diving, skiing, snorkeling etc. Also this 1080p sports camera comes with a remote controller. Users can control the camera remotely with the controller from 15 feet.